Center Channel, good match for the "Synergy" series. Picked it up on CL some years ago for $40 (an older lady was selling it with the original packaging and it looked new). Best $40 I ever spent. Currently have 2 receivers for HT sound, a Yamaha RX-V1 and a Denon AVR-3805. Mains are DCM TF-400's next to TV screen (hooked to Yamaha receiver) and RSL (old models with 12" woofer, 5" mids and tweeter) hooked to Denon. I have two 12" subs both hooked up to Yamaha with the RSL speakers sit on about 5 feet from TV screen on sides, plus a set of B&O speakers for rears.Oh, and another center speaker hooked to Denon a Kenwood ?. I love the C5 and it can handle power and it very clear for dialog and realism. 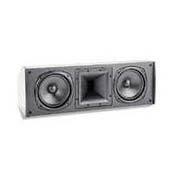 My goal is to get a Klipsch KLF-C-7 and put the C-5 as a rear center since the Yamaha supports it. I only watch movies and this budget system is very satisfying. I would recommend the Klipsch C-5 if you can find one. Craigslist has been great for making a superb system on the cheap. I stumbled across a complete set of KSF speakers about 5 years ago, in one auction, on eBay and bought it all for $500 to create a new home theater (KSF-10.5, KSF-C5, KSF-S5, and the KSW12). Yes, I got an amazing deal and gladly paid the $300 shipping to get them home. Once all the construction was completed, I connected the speakers to an Onkyo TX-SR600 receiver and spent hours adjusting everything to get it just how I liked it. The system sounded very good.....so I thought. As technology changed, I wanted to upgrade to HDMI and be able to view the video source either on my theater screen or an LCD on the adjacent wall - so I started looking for a receiver with two HDMI outputs (not many options at that time). As a result, I took the plunge and purchased the Yamaha RX-V3900 (140 watts/ch, .04%, and $1400) and set it up....page by page. I purchased the amp to improve my video quality and capability, but I had no idea what it was going to do to my sound quality. The KSF speaker sound is amazing - and everyone is blown away that hears them. I have read several reviews that say the same thing - your receiver (amp) has a huge impact on the performance of the KSF speakers. If you plan to audition any set of speakers - try listening to this song (AFI - Prelude 12/21) because it has 3 distinct sections that build upon themselves and when phase 3 kicks in, your room will be pulsing with crystal clear highs and thunderous lows. I recently moved to NC and was able to take all my equipment with me. My new theater room is much larger and is coming along nicely. I have no intension of parting with the KSF speakers or the Yamaha RX-V3900. If anything, I might be looking to add two more KSF-S5 speakers for the 7.1 surround. Glad to see they are still available on eBay - but not often. At this time, I only have the C5 and 10.5 speakers connected and I am very impressed at the sound quality with just 3 speakers. The C5 does a great job and I forget it is sitting on the floor under a 12' wide screen. I know they will sound better once I get the entire system connected and balanced, but the point is - the C5 does a great job. If you buy the C5 speaker or the entire system, you will not be disappointed. It ROCKS! I am not an Audiophile or sound expert - but I pride myself on quality rather than quantity. If you get a chance to buy the KSF speakers - they are monsters and love high quality power. Recommendations: Connect them to a high quality amp to get the best sound out of them. This is a great center channel which has exceeded my expectations. I picked it up from eBay for $137 and I feel I got an incredible deal; other auctions for the same unit have been in the $200 range. I’ve had a pair of KSF-10.5s for over 8 years that I’ve been using primarily as a music only system in the bedroom, but I’ve recently been upgrading that setup into a second home theatre. According to the manual for the older floor-standing KSF speakers, Klipsch recommends the C-5 center channel, claiming it has been engineered to work well with the 10.5s. And work well it does. I was blown away the first time I popped into a DVD with a good soundtrack. For music, the center doesn’t add a whole heck of a lot, but for digitally encoded movies, the difference is like night and day. I can’t recall ever having such a dramatic jump in overall system performance from one speaker. In overall system ratings, on a scale from 1 to 100, (with 1 being an old clock radio that emits high volume static whenever you touch a knob, 5 being your average stereo setup, and 100 being the ultimate perfection in audio), the introduction of the C5 jumped my overall ratings of the bedroom system from 60 to 75. It’s that dramatic. Voice matching with the 10.5s is superb. After I hooked it up and balanced it with the rest of the system, I ran the ‘360 sweep’ test from my diagnostics DVD that plays white noise in a circling pattern, blending the sound with the next speaker as it travels around the room. I could easily tell the difference from my rear speakers (the S5 surrounds are going to be my next purchase), but as it faded in and out from its neighbors, the 10.5s, you could close your eyes and not distinguish the difference between the speakers up front I’m also very pleased with how the system handles weaker power. My receiver, an old Yamaha RXV-592 which—ever since I purchased a separate digital processor that I use as a pre-amp--now acts as a standalone amplifier, provides 75 watts for all the front channels. Just like the 10.5s, the C5 handles that power masterfully. These things can get LOUD without noticeable distortion. With the inclusion of the C5, my bedroom home theatre now rivals the sound in most modern movie theatres. Granted, the small sound stage helps a lot; my bedroom is only 11’x13’. Nonetheless this is a fantastic center channel speaker, and I’m beginning to like it more then the Paradigm Studio CC-470 I have in the other room (but, as much as I love those KSF 10.5 speakers, they still can’t compete with the Reference Studio 80s in the main home theatre. I only have one complaint with the C5s: They’re really big. I can’t really fault Klipsch, since this was probably the smallest size they could make it without compromising fidelity. Currently it sits atop my widescreen Phillips 30” CRT, almost dwarfing it. The one center speaker is only a few inches shorter then a widescreen TV, and it looks almost comically disproportionate. If you have the KSF 10.5 or the KSF 8.5s, I doubt you’ll be able to find another center that will compliment the sound of your loudspeakers as well as the C5. There seems to be an auction for the C5 on ebay every few weeks, so it’d be worth checking it out. clear open sound, plays loud, no problems after 4 years and a lot of use at high levels, durable. I just bought a RC-35 to replace this older non reference center. I did not like the 35 as soon as I heard it. I then spent a few hours breaking it in but got no better. I did a lot of comparing switching back and forth. The KSF c-5 sounds better! More open, bright airy, clearer. I just put the 35 on ebay for $100 less than I paid for it. I want to hear a RC-3 side by side but this matches my RF-3s very well, the RC-35 did not. Great separation of voices. Great Value! A great center channel, especially at the price. I was looking at the C7, but my local hifi store had this on sale for $199. This was in June, so prices may have even dropped further. It does a great job with voice reproduction, second only to the Sonus Faber I listened to. Even with all the great things about it, I am pretty sure I will be upgrading to the new reference line fronts and center by the end of the month. Best sound I've heard yet. While working in a high-end stereo store I was fortunate enough to not only listen to, but to compare with equal everything the highest end Bose and the Klipsch. I thought I would wait a while before purchasing my own system so I could get a feel for the two. There was absolutely no waiting involved; I knew which was better right away. When the Bose representative left to go home early for the day (which was quite often) it was a free for all on his system. I would hook up the comparable speakers to the same receiver via speaker selector boxes, listen and just laugh. People would come in and I would do Klipsch/Bose comparisons for them . Needless to say 79 out of the 80 people that got to hear the difference walked out at night with Klipsch in hand. The one that didn’t had a Bose center, and a wife that told him not twice but three times that "the Bose would look better on top of the T.V." When she was gone he later nudged me and sure enough agreed the Klipsch sounded better. One further note, when I hooked the two center speakers up to compare (originally the Bose center speaker was not hooked up to the Bose system, now i know why) there laid the biggest difference in the sound quality. The best way to describe the two differences would be to imagine a 5-gallon bucket of water! Now imagine playing boths speakers side by side! Now imagine that Bose center speaker submerged in that 5-gallon bucket of water! That is the difference. And I was only comparing it to the Klipsch C-1 (one of the lowest end centers). Now I know why the Bose guy didn’t hook up his center, and also why he would never let me play my system when his was playing. From the moment I hooked this baby up I fell head over heels in love with Klipsch !! This is a real performer, never before have I heard such clear highs and mid's from a resonably priced center channel. Right away I could tell what I had been missing with my old center. Every little whisper came through excellent!!! The voices sound so real and in your face it's amazing, sure there's better speakers out there but for $300 bucks this speaker is jaw-dropping. I can only hope all that read this go out and take a listen of this truly amazing center channel. This speaker makes it sound like your really in the movie, and not once have I experienced the "harshness" sometimes associated with horn tweetwer's. Klipsch really outdid themselves with there 4th generation Tractix compression horn tweeter technology!! And the 6.5 inch woofers bass response is right on target and never sounds distorted. I highly suggest you check these out !! Claity of the human voice on this speaker. It really is clear, and gets down to low whispers as clear as if you are there. Projection into center of screen is excellent. Size, but the outstanding sound is the trade-off. I highly recommend this center channel speaker. I can't believe what a difference a matched center channel speaker makes in a system. Bose , but wasn't true center channel. Did listen to Infinity, KLH, Yamaha and settled on Klipsch for matched system. I purchased the unit from Sound Advice on clearance. I got one for myself and another for my sister. We both love the improvement in the center channel sound. I'm hearing more sounds than with the old Advent center channel. I suggest you purchase this speaker! I got this speaker as a floor model for about $250. The sound is incredible! Great highs and even great lows from a center channel. I have the C5 paired with some Klipsch KSF 8.5s that are sonically matched. Movies never sounded so good. I think Klipsch has discontinued these so if you can find one snag it up. I highly recomended this speaker. 5 speakers all the way.